Lago Villaggio Glen Eagle Homes: Beautifully renovated home with an open floor plan in Glen Eagle Country Club. This home offers a scenic view of the private lake as you enter the front door. Kitchen has been recently remodeled featuring all wood white shaker cabinets with soft closing doors and drawers, quartz countertops, tile backsplash and stainless steel appliances. Second floor has been expanded adding to the square footage of the home making it a great play room or entrainment area. Interior of home has been recently painted. Great size walk-in closets. Three car garage. This home comes with a social membership which provides members with access to all the amenities Glen Eagle Country Club has to offer such as par-70, 18 hole championship golf course, recently renovated club house, restaurant, fitness center, tennis court and golf from May 1st to October 31st. 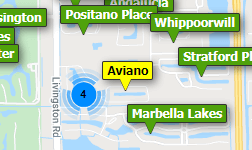 This community is located near fifth Ave. downtown Naples where you find restaurants, shops and stunning beaches. Seller is a licensed FL Real Estate Agent. Lago Villaggio Glen Eagle Homes: Enjoy the lifestyle that sunny Naples has to offer in this lovely, well appointed large two-story home filled with upgrades. This 3 bedroom with den/ bonus room has an desired floor plan with your guests on the second floor and master on the bottom. Included upgrades are a very private resort-style paver lanai with pool , spa and waterfall, soaring ceilings, upgraded travertine floors and granite throughout. The master bedroom is situated on the first floor and features dual walk-in closets hand scraped hard wood and double vessel sinks on dual vanities. This lovely home sits on a beautiful, lushly landscaped lot in Glen Eagle, just four miles to 5th Ave. and the beach. Publix, Starbucks near by. This home includes a social membership. Note fee's include cable, internet , guard gate and lawn maintenance. The club house is near by and has fantastic food. Club house recently updated. Golf with a member during season if you wish (you are not paying for golf this is social membership) or golf all you want during off season. Home currently has a renter paying $2500 per month would like to stay or will move within 60 days. Great for investment property. Lago Villaggio Glen Eagle Homes: Clean as a whistle with an updated kitchen, this two story home in the Lago Villaggio neighborhood of Glen Eagle Golf and Country Club, has a huge upstairs open loft area and beautiful resort style pool and spa. Located near the end of a cul de sac and bordering on a quiet preserve area, this home provides an atmosphere of privacy, peace and tranquility for its owners. Open floor plan with a variety of options for dining and living space plus the large loft and Master Bedroom suite on the first floor are features that create a feeling of openness and space. Roll down 'teflon' screening covers the entire covered lanai space which allows for easy and total storm protection and light. Social Membership in the Glen Eagle Country Club, which is deeded with this home, provides the owners with access to the recently renovated clubhouse with a restaurant, bar and grill room, tennis courts with a full time tennis pro, a new fitness center and large community pool. Golfing privileges are available from the end of April through the end of October. Glen Eagle is located just five miles from downtown Naples with easy access to its restaurants, galleries and shops as well as the Gulf of Mexico. Lago Villaggio Glen Eagle Homes: Beautifully appointed four bedroom two and a half bath home in the Lago Villaggio community of Glen Eagle which is just 4.5 miles from downtown Old Naples restaurants, shoppes and galleries and the Gulf of Mexico. Lago Villaggio is a pet friendly neighborhood, with a two pet allowance and no weight limits. Enjoy dinner on your lanai overlooking the solar heated pool and spa or take a quick ride or walk to the Glen Eagle clubhouse for cocktails and dinner with friends. Save a substantial amount of money in electric bills, as this home is partially powered by Solar Panals. Electric storm shutters front and back, provide security and protection. Full time monitored ADT alarm system service is supplied at no cost by the HOA. This lovely home comes with a social membership that enables you to play golf from May through November. Not a golfer? Tennis, pickle ball, bocci and many other activities are available to social members. This is the lifestyle you've been waiting for, come and enjoy all that Glen Eagle has to offer! Lago Villaggio Glen Eagle Homes: LAKEFRONT 4 bedroom home with one of the finest PREMIUM LONG LAKE views! ITS THE BEST LOT IN Lago Villaggio !St. Tropez floor plan with 2742 Sq. Ft. under air, 3864 sq ft of total living space. First floor /large living and dining room accented with custom mirror wall. DELIGHTFUL kitchen with wood cabinets, granite counter top, and WALK-IN PANTRY. Sliding glass doors from family room open to screened in Lanai with pool and spa. One guest ensuite and large laundry room. Second floor master suite with sitting area, gigantic closet, plus sliders to 40 Ft X 12 Ft’ Sun deck over looking the lake.Master bath has dual sinks, separate shower and soaking tub. Two spacious guest bedroom with shared bathroom. NEW LOOK with lights, landscaping and several home owners have been transforming their homes upward of $200,000 in remodels. It looks like a new community! Sidewalks, underground utilities, and beautiful trees nestled with lakes and golf course. Social membership which includes Restaurant, Community pool, Library, Ping Pong, Tennis, Fitness Center, Pickle Ball, Bocce, limited Golf, Cards, and many more social activities. Low fees and Taxes.Two private gates for easy access. Lago Villaggio Glen Eagle Homes: H.13733 Motivated Seller! Costly upgrades and improvements were made by the current owner such as Hurricane Impact windows, Electric Shutters on the lanai, and Solid Hardwood Floors (costing more than $50,000). This is a stunning 2-story home situated on a quiet street within a gated community, yet only 4 miles to Old Naples and the beaches! The Living/Dining area has dramatic 18 ft ceilings and opens into a roomy Kitchen and Family room, with easy to care for Tile Floors. There are lovely decorator touches such as plantation shutters, French doors and custom window treatments. The large Master Suite is on the first floor with 2 walk-in closets, has a large Master Bath with double sinks, separate soak tub and shower. There are three bedrooms upstairs one set up as an office, with ample room for family or friends. HOA is low, yet you can enjoy the newly updated clubhouse for dinner or drinks, stay in shape at the new state of the art workout facility, or play tennis. Golf is available for a golf cart fee from the end of April thru the end of October. Enjoy the feeling of country living, yet close to everything, and it's great for family and entertaining. Lago Villaggio Glen Eagle Homes: Full Golf Membership comes with this home, located on a quiet preserve area and a cul-de-sac. Lago Villaggio is pet friendly neighborhood, allowing two pets with no size restrictions. Very well maintained, this 2,140 sq ft home offers everything you could ask for including all new stainless steel Whirlpool appliances installed in Dec 2018. Open floor plan, tile on the diagonal in the living areas, recently painted exterior, custom TV and fireplace system in the living room, and a 4 foot extension to the garage are features that set this home apart from others. Master Association fee of $4,533/yr covers High Speed Internet and TV along with the full Golf Membership and access to the recently renovated clubhouse, restaurant, bar and grill room, tennis courts with a full time tennis pro, a new fitness center and heated community pool. The Lago Villaggio HOA fee of $490/qtr provides ADT alarm monitoring, all landscaping, and pest control. The assessment for golf course and restaurant ($3,000) has been paid in full. Located just five miles from downtown Naples with easy access to restaurants & shops as well as the Gulf of Mexico. Sellers are licensed FL real estate agents. Lago Villaggio Glen Eagle Homes: Come own the largest home with the smallest price tag in the best and newest neighborhood of Glen Eagle Country Club. This LIKE NEW home is located on a quiet cul-de-sac and only 15 min to 5th Ave S & the pristine Naples beaches! The cook will appreciate the generous working space in the kitchen and you can’t help but smile while living in this light and bright floor plan. Enjoy the private guest suite plus convenient office. Do you need numerous closets and a nice garage? You got it. You can’t beat this lifestyle. Are the kids grown and gone? Now it’s your turn to be a kid again. At Glen Eagle enjoy biking, swimming, tennis, Pickleball, Bocce, fitness, the fine restaurant, April to October Golf privileges, planned social events and trips. Annual HOA fees under $5,000. This amazing home answers the question, why move to the Paradise Coast of Florida? 264 days of sunshine, good health, upscale shopping, music venues and lively nightlife! FREE ONE YEAR HOME WARRANTY. Lago Villaggio Glen Eagle Homes: Beautiful home. Rare lot in Naples with this much yard space between your neighbors on a private cul-de-sac. Master Suite on the 1st floor, along with another 2nd Bedroom and 2 bathrooms. All Tile in main living areas. New A/C. Eat-in kitchen with breakfast bar opens to family room. And easy living with Yard maintained for you. Social Membership included at lowest fees around. Clubhouse with formal and informal dining, bar, Full Fitness gym and classes included, Pool, Bocci ball, Cards, Library, Billiards, Ping pong, Putting Green, har-tru clay Tennis, Pro Shop. Go ahead and Golf May to Nov, and use a long list of Reciprocal Clubs too. All conveniences 1 minute out front or back gates. Prime location only minutes to Olde Naples, Shops, Dining, art, theatre & more! Addison Reserve Glen Eagle Homes: Superior pride of ownership shines throughout this unique home. Tray ceilings, crown molding, custom designer and artists touches around every corner. This home is one of a kind, a must see. This large 2+Den/2 bath home in desirable Glen Eagle Golf and Country Club is deeded with a social membership which allows for off-season golf play without the high fees. The Country Club and restaurant were just remodeled and feature a sports bar and fine dining options along with an option for casual fare at the Divot next to the fitness center by Hole 10. Everything here is top-notch. Glen Eagle Homes: Golf membership included in this excellent golf community home for sale! On the course, full shrubs and trees block provide a scenic view without seeing golfers. Close to beaches, shopping and Olde Naples. Centrally located – gated community. Move-in ready. New floors, new paint, new master bath, new kitchen counters, new countertops, new backsplash. Come and put your own finishing touches on this fantastic 3 bedroom with a pool home. This house is a MUST SEE!!! Brittany Place Glen Eagle Homes: V.2851 A Full Golf Membership is available with this spacious 2 bedroom plus den, 2 bathroom pool home. Sun comes in through a wall of windows in the living area of this open concept floor plan. Features include white kitchen cabinets, solid surface counter-tops and tile in the living areas. This attached villa lives like a single family home with a wide open side yard and preserve landscape beyond the screened lanai which offers privacy all around. The lanai is paved as is the extended driveway offering plenty of parking space. This home is offered Turnkey Furnished giving you the freedom to move-in and start golfing at Glen Eagle's recently renovated 18-hole golf course. Glen Eagle is an active community offering members a remodeled club house, tennis, lap pool, fitness, bocce ball, billiards, library, fire pit and more. Just minutes from Old Naples dining, shopping and beaches, Glen Eagle Golf and Country Club offers everything you enjoy. Lago Villaggio Glen Eagle Homes: Well maintained two bedroom plus den single family home in the Lago Villaggio neighborhood. Additional space was added originally to the front guest bedroom with a bay window extension and there is a water softening system. New glass enclosures in both bathrooms, and California closets plus updated landscaping are added features. Lago Villaggio is a dog friendly neighborhood of 105 single family homes and the association is well run and totally funded. Social Membership in the Glen Eagle Community provides full access to the recently renovated clubhouse restaurant, bar and grille, har tru tennis courts with a full time tennis pro, a community pool, fire pit, free standing workout facility and a half way house on the golf course that offers casual restaurant food. Golf is available for social members from the end of April thru the end of October. Glen Eagle is only five miles away and an easy ride to downtown Naples, its galleries, restaurants and shops, as well as the beautiful Gulf of Mexico. Brittany Place Glen Eagle Homes: V.2853 - Lovely villa on a lovely street in Glen Eagle that feels like a single family home. Upgraded wood cabinets, granite counter tops, tile in all living areas and beautiful wood floor in den. Open feeling enhanced by volume ceiling makes the almost 1900 square feet feeling even larger. There is plenty of room for family and friends to gather. Large master bedroom, double sinks, 2 closets. Large lanai with pool backs up to preserve to provide a very private setting. One of the few homes in Glen Eagle with golf membership not required. Montclair Park Villas Glen Eagle Homes: Your Dream Florida Lifestyle! Live large with 1880 sqft, 3 Bedroom Plus Den, 2 car attached Garage. All Furnished if desired. All Electric Shutters and Hurricane windows for easy closing or peace of mind when away. Easy one floor living has All Tile on diagonal, no carpet. Extended Lanai adds outdoor living to entertain or read a book over relaxing landscaped back yard and end unit ficus privacy. You'll notice Plenty of storage -- Custom Storage closets, garage cabinets, pull out kitchen drawers. Adorned with Plantation shutters, Crown moldings, Coffer ceiling, Gorgeous Granite, Designer Tile and accents. A Dream Garage -- utility sink, work area, and a Big SAFE for all your valuables. NEW ROOF. Save $ as includes Insurance coverage, lawn maintenance, cable and internet. TRUE EASE of living for aging in place or anyone who would rather PLAY! Includes FULL Golf Membership, pro shop, putting green. Fitness gym and classes included, Tennis, har-tru courts. Clubhouse Dining, Bar, Billiards, cards, library, art, Bocci ball, events. All conveniences right out gates. Only 4 miles to Beach, Shops, Dining, theatre, Art and more. Perfect Full or Part time! Brittany Place Glen Eagle Homes: H.14265 You must see this beautifully maintained attached villa on a premium lot. A Social Membership is included in this 2 bedroom+den, 2 bathroom pool home. The roof is new and the improvements many. This home's original floor plan was improved at the time of purchase to expand the living areas and provide additional room in the master bedroom. Custom wood cabinetry in the kitchen and pretty granite accentuate the sunny eat-in kitchen where extended cabinets and counter space have been added. Tile throughout is a plus as are the soaring vaulted ceilings. The owners added plantation shutters and custom inlay tile work to the dining room floors and kitchen backsplash. Bedrooms and bathrooms are generous with sliders in the master bedroom as well as the living area. The outdoor living is substantial on a paved lanai that overlooks beautifully landscaped lawns and exclusive privacy on one of the largest lots in Brittany Place. All of this in the desirable community of Glen Eagle where amenities are plentiful and the location even better. A social membership offers golf from May to October with club house, dining, swimming, tennis, bocce ball and fitness available year-round. Oxford Village Glen Eagle Homes: Stunning two bedroom plus den single family home speaks of perfection. Upgraded bamboo wood flooring in living room, dining room, den and master bedroom. Custom wood flooring in the guest bedroom and travertine tile throughout the rest of this beautiful home are accentuated by cherry wood kitchen cabinets, granite counter tops and tumbled tile backsplashes, granite sink, custom light fixtures and tray ceilings. Crown molding and chair rails finish off each room. Social membership in the Glen Eagle Country Club provides access to the newly renovated restaurant, bar and grill, state of the art work out facilities, heated pool and clay tennis courts. Physical fitness classes, trips and other activities of the community are part of the social scene as well as having Golf available from the end of April through the end of October. Glen Eagle is only four miles to downtown Old Naples and four and a half to the Gulf of Mexico! Brittany Place Glen Eagle Homes: Beautiful villa with heated pool and Social Membership in desirable Brittany Place. Brand new roof to be completed with approximate date of completion at the beginning of June. This villa has many custom upgrades including, brand new screened lanai, upgraded white cabinets, stainless appliances, granite countertops, tile throughout living area, window treatments, dimmers and fans and beautiful landscaping. Rolling shutters on the windows. Alarm system. 2 walk-in closets in master bedroom. Wood flooring in the den with an amazing built in office. Brittany Place Glen Eagle Homes: Spacious move in ready Glen Eagle villa on ideal Cul-de-sac lot. Bright and sunny, this recently updated home features stainless steel Bosch/Samsung appliances, LG washer and dryer, updated tile floors, fresh paint and a new roof. Enjoy peaceful preserve views from the large screened lanai, and the generous two car garage allows for ample storage. A social membership to Glen Eagle Golf and Country Club is included allowing for use of the restaurants, clubhouse, fitness center and golf from May through October. Glen Eagle is a coveted private, gated community minutes form world class shopping, dining, beaches, and everything else Naples has to offer! Addison Reserve Glen Eagle Homes: Location, location, location! This single family home resides southwest of I-75 alongside Radio Rd. permitting easy and quick access to all that Naples has on offer. Naples Beach and Fifth Ave. S. are just under 4 miles away! The home has been very well cared for and features a newly updated kitchen with 42” cabinets and a walk-in pantry. The bedrooms are split so there is plenty of privacy for those in the Master Bedroom and Guest Bedroom areas. The Den can easily be used as a 3rd bedroom if wanted or needed. The rear lanai and pool are welcomed additions to a lovely property overall. Glen Eagle is an established golf community held in high regard and this home comes with a full deeded membership to the club. Dining, golf, fitness and social activities are numerous and loved by all that live in this spectacular development. At this price point you will not likely find a single family home with a pool in such a beautiful community and spectacular location such as this. Addison Reserve Glen Eagle Homes: Sunny and spacious turnkey furnished Bristol single family home with social membership (golf May through October); 2 BR plus den. Tile on the diagonal in all common areas, paver screened lanai. House painted 2015. Air Handler replaced (2013). New garbage disposal (2016). Corian counters in the kitchen with Whirlpool appliances. Whirlpool washer & Dryer with utility sink in room off kitchen. Direct access from garage into laundry room. Open floor plan, eat-in kitchen. Private back yard. Par 70 Gordon Lewis designed 18 hole course measuring from 4300 to 5600 yards. Four Har-Tru tennis courts by clubhouse which are lit at night. Full fitness center open from 5 a.m. to 10 p.m. every day plus separate classes for Yoga, Strength & Fitness Fusion. Water aerobics at the Club pool which is heated in winter months. Bocce is also offered. Clubhouse will sport a new dining room & grill room in the fall of 2018. Billiards & card rooms are also located in the clubhouse. Home is 6 miles from downtown 5th Ave. shopping, dining, live theater, art galleries & pristine Gulf of Mexico beaches. Easy access to I-75 No. and So. 25 mins. to Regional Southwest airport. Close to Marco Island.